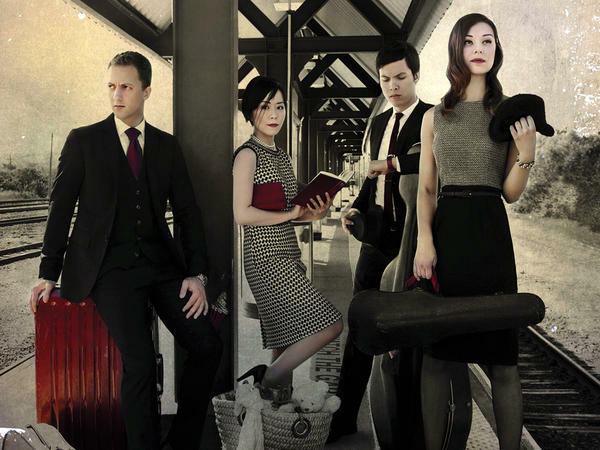 The Attacca String Quartet's latest album celebrates John Adams. Robert Frost's famous poem "The Road Not Taken" begins with the line: "Two roads diverged in a yellow wood." Frost's traveler must choose between them. But slide that metaphor over to the world of classical music and you will discover hundreds of paths to explore. In this visit to All Things Considered, host Jacki Lyden and I share the radiant voices of a top-notch Latvian choir; the bustling energy of a young, smart string quartet; the sophistication of a venerable but embattled symphony orchestra; and a potent alliance between a jazz composer and an adventuresome opera singer. If you're just joining us, this is WEEKENDS on ALL THINGS CONSIDERED from NPR News. I'm Jacki Lyden. And it's time now for music. LYDEN: This is the Latvian Radio Choir singing music by Rachmaninov, just one of the handful of intriguing recordings that have recently crossed the desk of our guest, NPR's classical producer, Tom Huizenga. Tom, welcome back to the show. TOM HUIZENGA, BYLINE: Jacki, great to be here. LYDEN: It's great to have you. I'm just kind of gigging here because this music is so luscious. Just tell us about it. HUIZENGA: Well, it's a Russian Orthodox sacred music by Rachmaninov. It's called "All-Night Vigil," sometimes people refer to it as his "Vespers." He composed it in 1915. And I just think it just sounds gorgeous. 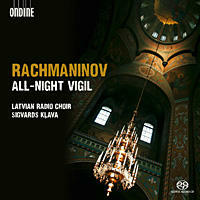 This is a new recording by the Latvian Radio Choir conducted by Sigvards Klava. Now, there's no orchestra here, just about two dozen voices, but Rachmaninov does get, I think, some terrific coloristic and orchestral effects in the writing. And there's one section where he has sopranos ring out like tolling church bells, and in this section we'll hear now, he gets a very rich, almost symphonic layering with the groups of voices, you know, shining, kind of like rays of light through stained glass. HUIZENGA: The high voices are so good. LYDEN: Oh, right. Can't you just see sort of the shafts of sunlight falling through those stained glass windows' direction? LYDEN: And, you know, you're - this is the Latvian Radio Choir, as you said, with this music by Rachmaninov. You know, in this "All-Night Vigil," Tom, he's written this in 1915, and, of course, that immediately brings up the thought that this is the time of the Russian Revolution, lots of turmoil, horror, a crackdown on all things sacred. How did the music survive? HUIZENGA: Well, right. The Bolshevik party, as we know, frowned on religion, so this piece had a relatively short shelf life at first. I would imagine there must have been, like, underground performances of it over the years. But this "All-Night Vigil" was actually not recorded until 1965. So that was a - that's a long time. There are many recordings of it now, but this new one, I think, is spectacular. The Latvians are a nation of singers. And this particular group has a gorgeous blend of voices. LYDEN: Yeah. This music's spectacular. So, Tom, what else did you bring to us? You've got such an eclectic collection today. HUIZENGA: Well, how about a smart, young string quartet and a dog jam? HUIZENGA: This twisted little hoedown is called "Dog Jam." It's from composer John Adams from a suite of pieces that he wrote for a string quartet and tape called "John's Book of Alleged Dances," written in the mid-'90s for the Kronos Quartet. But here, we've got the young Attacca Quartet putting a fresh spin on it. It's a new record dedicated to string quartet music by John Adams. LYDEN: You know, it's cool. As - I know John Adams from his operas like "Nixon in China," but I don't really think of John Adams as the composer of string quartets. HUIZENGA: Yes, we do know him from his operas and his orchestral music, and he really has only written one formal string quartet, which is also on this new album. That piece is from 2008. It's more serious than the "Alleged Dances" we're listening to, a very eclectic piece in itself. Let's listen to the very opening of it where you can hear kind of Adams' minimalist roots. There's these repeating figures in the strings and a popcorn-like pizzicato in the cello. LYDEN: You say popcorn? I say bees buzzing. LYDEN: Yeah, it really is some alliterative percussive coolness. HUIZENGA: It is. It's definitely moving out there. But now, soon, you know, soon after, in this first movement, the piece opens up, but it still keeps shifting from one cell to another, kind of in a kaleidoscopic way. Now, here's a section where the strings are pulsating very softly. HUIZENGA: And then a severe left turn to a super driving beat. HUIZENGA: Then a screeching halt. HUIZENGA: Everyone takes a breath. HUIZENGA: And then soon, out of nowhere, there's this very lovely melody in the first violin. LYDEN: Whew. I think I'm out of breath. This is just gorgeous. Well, that's fantastic. 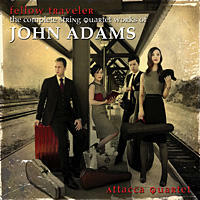 Some of the string quartet by John Adams from a new CD by the Attacca Quartet and just one of the new releases by my guest, Tom Huizenga. He's been listening to a lot of really cool stuff lately. And, of course, Tom is our classical music producer at NPR Music. And, Tom, looks like you have more unlikely pairings of artists for us. HUIZENGA: Yeah. Here's what happens when a jazz band leader pairs up with an opera singer. DAWN UPSHAW: (Singing) Spring, the sky rippled with geese but the green comes on slowly. HUIZENGA: Maria Schneider is the composer. Dawn Upshaw is the soprano. Now, Schneider normally leads a big jazz band, but here, she has just a few band mates added to the members of the Australian Chamber Orchestra. The poems are by the former U.S. poet laureate Ted Kooser, and the album is called "Winter Morning Walks," a very satisfying marriage of words and music, I think. LYDEN: Oh, boy, I couldn't agree more. This is just sumptuous. How did these two relatively opposite musicians get together? HUIZENGA: Well, Dawn Upshaw is - was basically a fan of Maria Schneider, saw her in jazz clubs in New York and thought, well, maybe they could do something together, and this is actually their second collaboration. But there's actually another back story to the record that's quite moving. In the late 1990s, Ted Kooser was recovering from cancer surgery, and he wasn't allowed to be out in the sunlight. So he took these pre-dawn walks, and he also was suffering from writer's block at this time. But eventually, one morning, he decided to write a short poem on a postcard to a friend, and that unlocked it. And he began writing a poem every day, sending it to this friend, and soon, he had 100 poems. LYDEN: Oh, what a story. I'm totally hooked. Let's hear more. HUIZENGA: All right. This one's called "Walking by Flashlight." And, Jacki, why don't you read a poem? It's a short one. LYDEN: Thank you for asking me. (Reading) Walking by flashlight at six in the morning, my circle of light on the gravel swinging side to side, coyote, raccoon, field mouse, sparrow, each watching from darkness this man with the moon on a leash. UPSHAW: (Singing) Walking by flashlight at six, at six in the morning, my circle of light on the gravel swinging side to side. HUIZENGA: I love those warm strings and that gentle rocking beat, like footsteps. LYDEN: I know, I know. I can absolutely see Kooser doing exactly that. 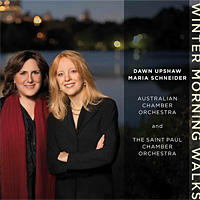 And, of course, those lyrics sung by soprano Dawn Upshaw, singing "Walking by Flashlight, this poem by Ted Kooser with music by Maria Schneider from the new album called "Winter Morning Walks." Tom, we've got time for one more album. HUIZENGA: OK. I've got good news and bad news. What do you want first? LYDEN: Uh-oh. Mm, I guess the bad news, so I can look forward to the good news. HUIZENGA: OK. Well, the bad news is that the Minnesota Orchestra is still silent. LYDEN: You know, I read about this. Musicians and management there are kind of locking horns in a labor dispute. HUIZENGA: They are still locking horns. It's very sad. The orchestra hasn't played a regular concert in over six months. They're still fighting over finances. But the good news is that the players and their terrific conductor, Osmo Vanska, made recordings before the lockout, of course, and they are just terrific. 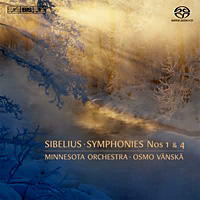 They're making their way through the seven symphonies of Finnish composer Jean Sibelius. And Vanska's a Finn himself. And let's hope that the - the excellent Minnesota Orchestra, you know, 110 years old this year, let's hope it gets back on its feet very soon. LYDEN: Boy, that'd be a good way to celebrate. Tom Huizenga is the classical producer at NPR Music. And you can hear more of his excellent, excellent picks today at the blog Deceptive Cadence - title I love - and that's at nprmusic.org. And, Tom, love it when you come in. Thanks again. HUIZENGA: Hey, thanks, Jacki. Always a pleasure.